Did that title grab your attention? Great. Happy National Beer Day! When you open your fridge shortly after five o'clock this evening (or whenever—it's five o'clock somewhere), an amazing variety of innovative, high-quality beers may should be staring back at you. But this has not always been possible for Americans: first, because a significant number of households did not own a fridge until the 1920s, and second, because purchasing beer has not always been legal in this country. From 1920 until 1933, Prohibition banned the manufacture, transportation, and sale of intoxicating beverages in the United States. Prohibition was, at first, a catastrophe for American beer. (You might be saying, "I thought it was fantastic for American beer? And what about homebrewers?" We'll get there.) Prohibition halted brewery operations and erased the social worlds of the 19th-century saloon and biergarten. 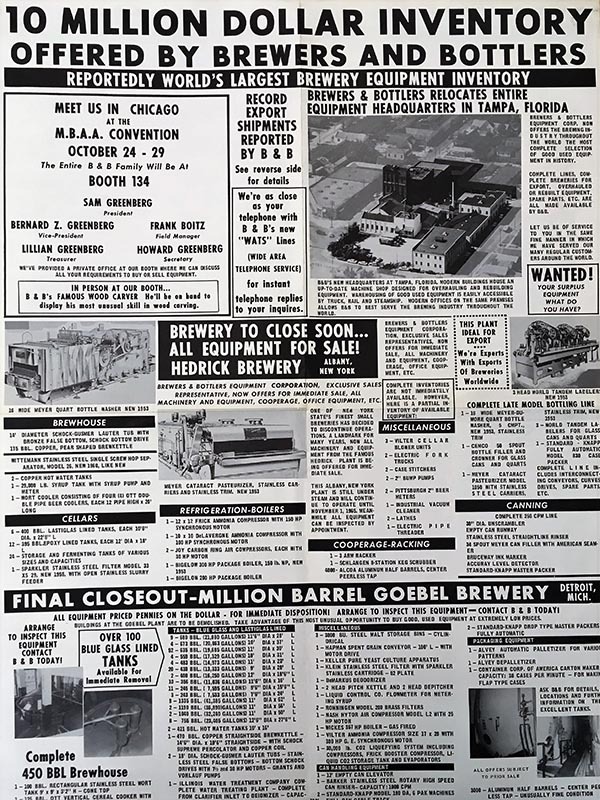 The brewing industry's implosion was both immediate (hundreds of breweries shuttered) and slow to unfold (others clung to life, only to close in the years following repeal). Big breweries had the resources and infrastructure to wait out the dry years. After repeal, the big fish gobbled up the smaller fish. With consolidation, American beer homogenized. Pale, light lager became American beer. Notice of brewery auction, around 1965. Hundreds of American breweries closed in Prohibition's aftermath. Courtesy of Walter H. Voigt Brewing Industry Collection, Archives Center. Well, homebrewers didn't actually enter there. They had been there from the start. Until the mid-1800s, Americans brewed beer at home. Homebrewing was an unglamorous necessity: a domestic chore akin to baking bread. Women, servants, and enslaved men and women were America's original homebrewers. Most brewed low-alcohol "small beer" that was less popular than cider and far less potent than rum, but safer than water to drink. Then, with the immigration of professional German brewers in the mid-19th century, beer became big business in the United States. 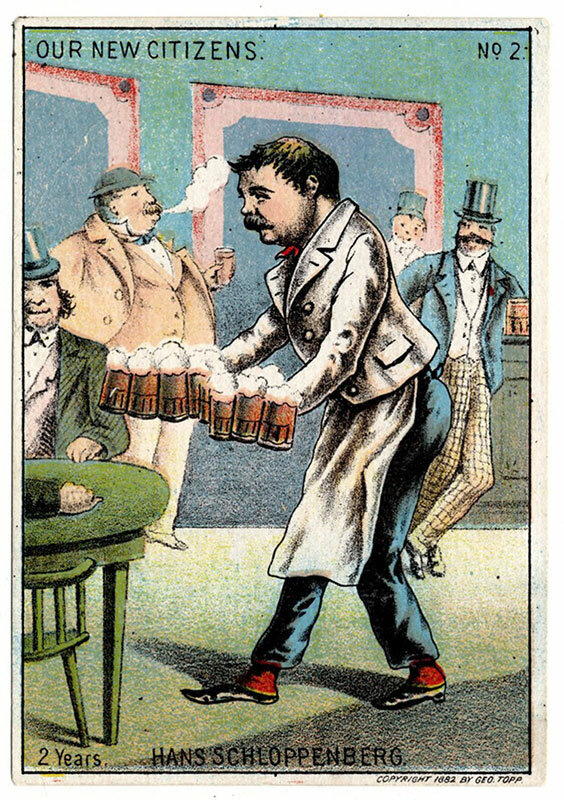 After the Civil War, Americans entered wage-earning jobs and found networks of brewery-backed saloons ready to quench their thirst at the end of the day. Americans no longer needed to brew at home. Beginning in the 1840s, German immigrant brewers brought new ingredients and brewing techniques to the United States. Trade card, around 1882. Courtesy of Warshaw Collection of Business Americana, Archives Center. By the early 1900s, however, temperance advocates had begun to achieve local and statewide bans on alcohol, blaming the beer-soaked saloon for society's ills. Looking to a future without beer, brewers concocted malt syrups and beer extracts, encouraging consumers to brew at home. When national Prohibition went into effect in 1920, some breweries continued to brew surreptitiously, as "wildcat" operations supplying local customers and funneling ingredients to homebrewers. 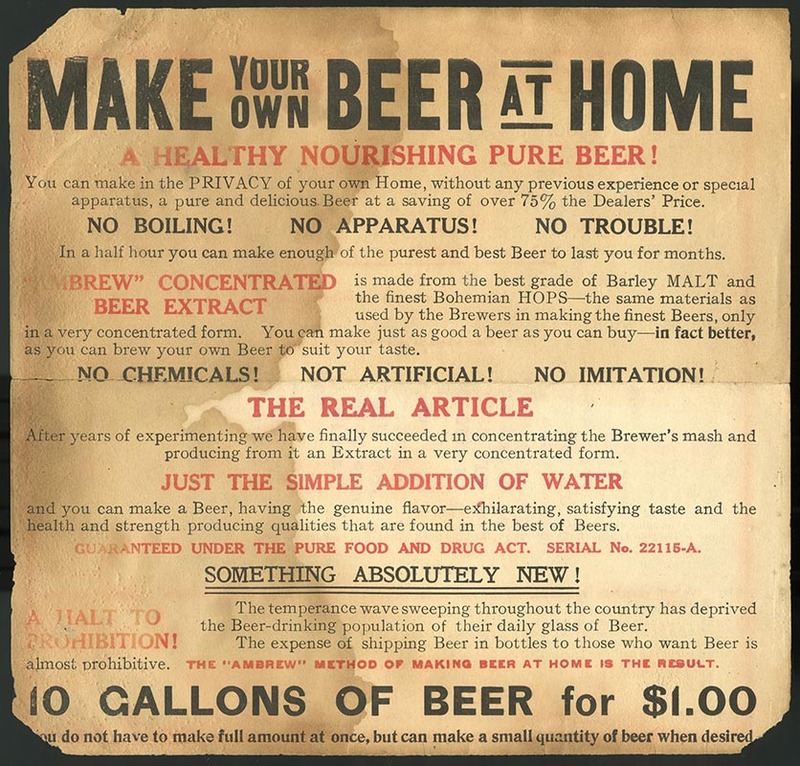 Most Prohibition-era homebrewing was not up to snuff, however. In 1932, American author Bob Brown quipped, "Good home brew is okay, but who is going to brew it. Brewing is a technical business for experts. . . . If prohibition fails to kill beer outright, amateur home-brewing may yet finish it off." Most beer drinkers wanted the real thing (or fled to the likes of Coca-Cola and ice cream sundaes) and rejoiced when beer became legal again in 1933. 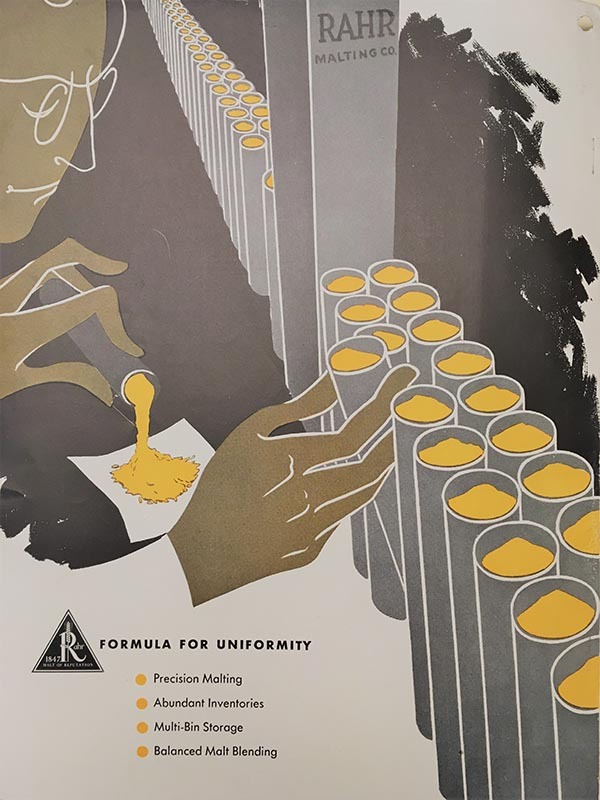 As Prohibition approached, the brewing industry created ingredients such as this "beer extract" to encourage Americans to brew at home. Advertisement, around 1900. Courtesy of Warshaw Collection of Business Americana, Archives Center. Not all improved overnight. The Depression left Americans short on cash to buy beer. Hasty brewery openings resulted in tainted batches and public health scares. In post-repeal decades, breweries continued to close or consolidate. Efficiency and uniformity became the name of the game in American brewing. Mid-20th-century American brewers prized efficiency, uniformity, and standardization in their ingredients and the brewing process. Advertisement, The Brewer's Digest Annual Buyer's Guide & Directory, 1954. Paradoxically, the bland homogeneity of mid-century American beer was the perfect motivation for things to get much more interesting. A handful of enthusiasts discovered the venerable beer cultures of Europe during military or educational travels abroad. They returned to the United States with brewing manuals and embarked on an under-the-radar hobby (homebrewing remained illegal until 1979), adapting hardware store equipment and repurposing supermarket ingredients to make better beer. 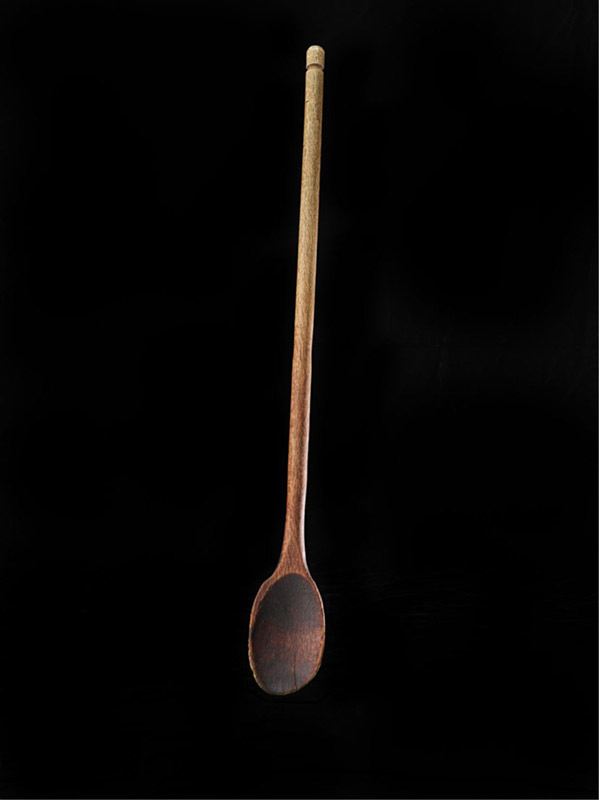 Charlie Papazian, "godfather" of American homebrewing, taught generations of American homebrewers with this spoon. And they did. In the 1970s Charlie Papazian published a whimsical guide to homebrewing, founded the American Homebrewers Association, and inspired millions with his maxim, "Relax. Don't worry. Have a homebrew." Michael Lewis, America's first professor of brewing science, was already teaching home- and soon-to-be craft brewers in his University of California, Davis, classroom and lab, as he would for more than 50 years. Ken Grossman, proprietor of a homebrew supply shop in Chico, California, taught himself to weld and scrounged for used dairy equipment to open a small brewery he called Sierra Nevada, after the mountain range he loved. The rest was history—our current, golden era of brewing history, to be exact. 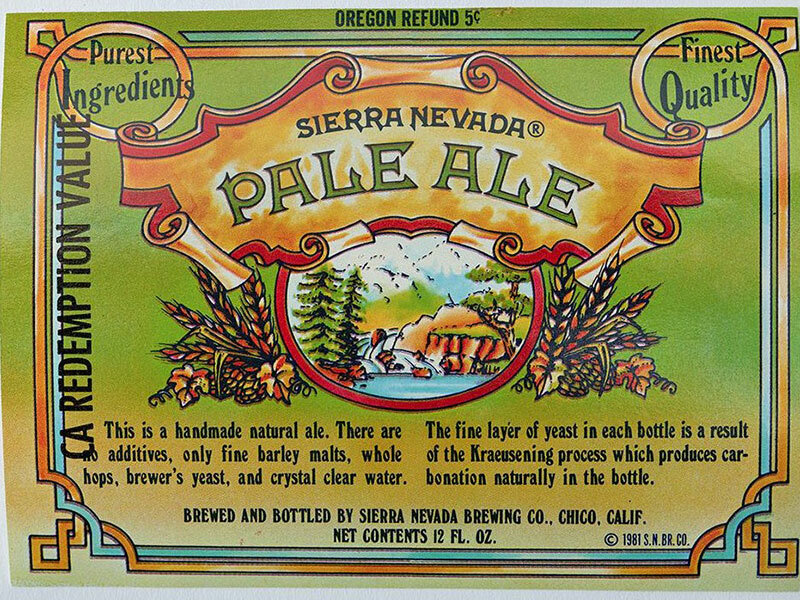 Sierra Nevada's iconic Pale Ale, first brewed in 1980, played a key role in developing Americans' taste for hoppy beers. Brewery founder Ken Grossman began his career as a homebrewer. The Brewers Association estimates that America now has more than 6,000 craft breweries and 1.1 million homebrewers. And according to Papazian, 90% of craft breweries were founded by brewers who began as homebrewers. Without Prohibition, would America have experienced a vibrant tradition of mid- and late-20th-century homebrewing? Probably not. Would America have craft beer without homebrewers? Definitely not. Increasingly skillful homebrewing in 20th-century America served as the critical link between Prohibition and our contemporary wonderworld of craft beer. So on this National Beer Day, cheers (and thank you!) to homebrewers. Theresa McCulla is the historian of the American Brewing History Initiative.